Israel 3 active / 2 under construction / 1 on order. Singapore 2 on order, with first delivery expected in 2020. Sweden 3 active / 3 planned. Sweden All 4 retrofit with AIP. Two eventually became the Archer class. and the other two became the Södermanland class. Singapore 2 active / 2 planned. Japan 8 active (of 9 completed) / 3 under construction / 12 planned. ^ "Tomorrow's Submarines: the Non-Nuclear Option". DefenseWatch. Retrieved 2 July 2012. ^ "Indian-built Scorpene to carry critical DRDO system". The Hindu. 3 November 2014. Retrieved 22 October 2015. ^ "Scorpene subs to have system to stay longer under water". The Times of india. 19 November 2014. Retrieved 28 November 2014. ^ "Classe Todaro page at Marina Militare website". Retrieved 27 April 2010. ^ "German TKMS will build Norway's submarines". navaltoday.com. 3 February 2017. Retrieved 5 May 2017. ^ "The Gotland class submarine - submerged several weeks". Kockums. Retrieved 6 April 2008. 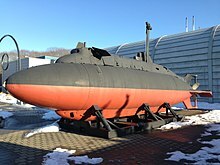 ^ a b "Kockums receives Singapore order to two submarines". Kockums. Retrieved 19 November 2005.